In order to fully appreciate the essentials of a wound closure, it is first important to understand the process of wound healing. Healing occurs in 4 stages—hemostasis, inflammation, proliferation, and remodeling. The hemostasis phase begins immediately after injury. While some authors consider this process part of the inflammatory stage, it should be recognized that in the process of hemostasis, the formation of fibrin and degranulation of platelets sets the stage for the subsequent stages. The inflammation stage begins shortly after injury. In this stage, mobilization of the components of the immune system remove damaged tissue and bacteria from the wound. The proliferative stage is the tissue-formation stage in which reepithelialization, angiogenesis, and fibroblast proliferation and migration predominate. During the final stage, the extracellular matrix, which is composed of fibronectin, hyaluronic acid, proteoglycans, and type III collagen, is deposited and constantly altered with the final accumulation of mature type I collagen. This stage may occur for as long as 6-12 months after wounding. Wound strength gradually increases throughout the healing process, reaching about 20% of the preinjury strength at 3 weeks. Postinjury skin strength ultimately only reaches 70-80% of that of normal skin. The components of the phases wound healing are depicted in the image below. Wound healing phases. Image courtesy of Mikael Häggström, Medical gallery of Mikael Häggström 2014, Wikimedia Commons. Also see Suturing Techniques and Surgical Dressings. The choice of a particular suture material should be based on the patient, wound, tissue characteristics, suture characteristics, and anatomic location. A surgeon's selection may not be specifically based on scientific data, but rather on the preferences that he or she learned from mentors and/or in training. Understanding the various characteristics of available suture materials is important to make an educated selection. No one suture possesses all desirable characteristics. The optimal suture should be easy to handle and have high tensile strength and knot security. Any tissue reaction should be minimal, and the material should resist infection and have good elasticity and plasticity to accommodate wound swelling. A low cost is preferred. Although some of the newer materials available have many of these properties, no one material is ideal and compromises must be made. Suture needles are depicted in the images below. Commonly used suture needles; cross-sections of the needle shown at the point, body, and swage. A is a taper needle, B is a conventional cutting needle, and C is a reverse cutting needle. Interaction between the needle holder and suture needle. A is a needle holder of appropriate size for the needle. B is a needle holder that is too large for the needle. Pressure applied by the needle holder leads to inadvertent straightening of the suture needle. C is a needle holder that is too small for the needle. The needle rotates around the long axis of the needle holder. The physical characteristics of a suture material determine its utility; these characteristics include configuration, diameter, capillarity and fluid absorption, tensile strength, knot strength, elasticity, plasticity, and memory. The configuration of a suture is based on the number of strands of material used to fabricate it. A suture can be monofilament (ie, single-stranded) or multifilament (ie, multistranded). Multifilamentous sutures are twisted or braided. United States Pharmacopeia (USP) sizes are standardized and related to a specific diameter range (in millimeters) that is necessary to produce a certain tensile strength. 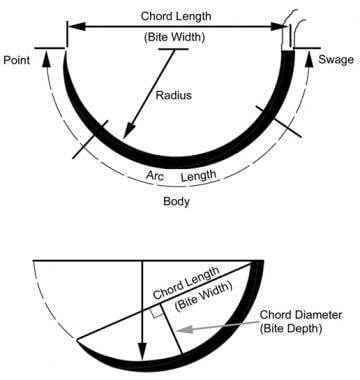 These diameter ranges vary with the different categories of suture material. These categories include natural materials, synthetic absorbable materials, and synthetic nonabsorbable materials. Sizes are expressed with zeroes, such as 3-0, 4-0, 5-0, and 6-0; more zeroes indicate a smaller size. The tensile strength of a material is the maximal stress that it can withstand before breaking. The rate at which a suture loses its tensile strength over time is not the same as its absorption and varies among suture materials. The implantation and tying of a suture decreases its tensile strength. Dry, unused, absorbable suture loses 4-13% of its initial strength after being soaked in sodium chloride solution for 24 hours. Knotted sutures have two-thirds the strength of unknotted sutures. In selecting suture material, the tensile strength of a suture does not need to exceed that of the tissue it is securing. The knot is the weakest portion of the suture. Its strength is defined by the force necessary to cause slippage. The 2 most commonly used types of knots in surgery are flat square knots and sliding knots. Flat square knots are considered more secure than sliding knots, whereas sliding knots allow for a tighter knot when tighter approximation of tissue is required. A surgeon’s knot is a square knot in which two knot throws are performed prior to tightening the knot. Although this initial throw adds no strength to the knot, it decreases the tendency of the wound to separate as the suture is tied. Numerous studies have evaluated the optimal number of knot throws to limit untying without excessive bulk, which may lead to suture exposure. While these results vary based on the type of suture and knot tying technique used, most concluded that four or five throws are optimal for sutures used in dermal closures. Plasticity is the ability of the suture to retain its new form and length after stretching. Plasticity allows a suture to accommodate wound swelling, thereby decreasing the risk of strangulated tissue and crosshatch marks. As swelling subsides, however, the suture retains its new size and may not continue to adequately approximate the wound edges. Elasticity is the ability of a suture to regain its original form and length after stretching. After the swelling of a wound recedes, the suture returns to its original length and keeps the wound well approximated. Most sutures are elastic; few are plastic. Memory is the ability of a suture to return to its original shape after deformation by tying. Memory is related to plasticity and elasticity. Sutures with a high degree of memory, particularly monofilament sutures, are stiff and difficult to handle and may be more prone to knot loosening and untying. Handling characteristics of suture materials are defined by pliability and coefficient of friction. Pliability refers to the ease with which a suture can be bent. The coefficient of friction is a measure of the slipperiness of the suture. Sutures with a high coefficient of friction, generally braided sutures, are more difficult to pass through tissue, thereby causing a greater degree of tissue injury during placement and removal. However, these sutures are more pliable, being easier to handle and manipulate for tying knots. Different suture materials produce varying degrees of tissue reaction, specifically inflammation. Significant inflammation reduces the resistance to infection and delays the onset of wound healing. The type of material and size of the suture are thought to be the major factors contributing to this reaction. Natural materials are absorbed by proteolysis, which causes a prominent inflammatory response, while synthetic materials are absorbed by hydrolysis, which produces a minimal reaction. Braided sutures have a high degree of capillarity, which is correlated with a tendency to absorb and retain both fluid and bacteria. These materials are associated with greater reactivity and may promote infection if bacterial contamination occurs during or shortly after surgery. Smit et al  histologically evaluated tissue reactivity to different suture materials (ie, silk, plain and chromic catgut, polyester, nylon, Vicryl, Maxon, Prolene) in rats 7 days after surgery. Interestingly, the study did not reveal any significant differences in tissue reactions. This finding suggests that surgical trauma may have a greater influence on reactivity than the suture material. The amount of suture placed in a wound, particularly with respect to the knot volume, affects inflammation. The suture size contributes more to knot volume than the number of throws. The volume of square knots is less than that of sliding knots, and knots of monofilament sutures are smaller than those of braided sutures. Allergic reactions to suture materials are rare and have been specifically associated with chromic gut. Chromic acids may provoke a reaction in individuals who are sensitive to chromate. Antimicrobial properties intrinsic to the suture and the addition of an extrinsic antimicrobial coating have long been theorized as ways of reducing surgical site infections (SSIs) by decreasing bacterial adherence to the suture, but such products have only more recently become available on the market. Currently available products use triclosan (Coated Vicryl Plus Antibacterial; Ethicon and Monocryl Plus Antibacterial; Ethicon). This antimicrobial biocide has been shown to reduce in vitro suture colonization with both methicillin-sensitive and methicillin-resistant Staphylococcus aureus and Staphylococcus epidermidis. A meta-analysis of 15 randomized controlled trials including a total of 4800 patients estimated a relative risk 0.67 (95% confidence interval [CI], 0.54-0.84; P =.00053) with an overall lower frequency of SSIs in patients in which triclosan-coated suture was used compared with those in which noncoated suture was used. Other antimicrobial suture coatings such as poly[(aminoethyl methacrylate)-co-(butyl methacrylate)] (PAMBM) have been shown to provide bacteriocidal activity against S aureus compared with the bacteriostatic property of triclosan in vitro  ; however, such products have not been tested in vivo and are, therefore, not yet available commercially. For excellent patient education resources, see eMedicineHealth's patient education article Suture Care. Sutures are classified as absorbable or nonabsorbable, natural or synthetic, and braided or monofilament. Numerous companies manufacture sutures; however, Ethicon, Syneture (United States Surgical/Davis and Geck suture division of Tyco Healthcare), and Look (Surgical Specialties Corporation) manufacture most of the sutures used in wound closure. Most sutures are available in standard 18- and 27-inch lengths. Several manufacturers (eg, Delasco, Look) provide sutures in 8-, 9-, and 10-inch lengths. These shorter sutures are less expensive and are used primarily for biopsy wounds or small wound closures. Absorbable sutures are defined by the loss of most of their tensile strength within 60 days after placement. They are used primarily as buried sutures to close the dermis and subcutaneous tissue and reduce wound tension. The only natural absorbable suture available is surgical gut or catgut. Synthetic braided materials include polyglycolic acid (Dexon; Syneture) and Polyglactin 910 (Vicryl; Ethicon). Monofilamentous forms include polydioxanone (PDS; Ethicon), polytrimethylene carbonate (Maxon; Syneture), poliglecaprone (Monocryl; Ethicon), Glycomer 631 (Biosyn; Syneture), and Polyglytone 6211 (Caprosyn; Syneture). Surgical gut or catgut was the first absorbable suture material available. Despite its name, catgut has never been made from cat intestines. It is actually made by twisted fiber formed from the collagen of the intestines of sheep, cattle, or goats. Surgical gut is packaged in alcohol to prevent it from drying and breaking. The 3 forms available are plain, chromic, and fast-absorbing (Ethicon). Plain gut elicits a marked inflammatory reaction in tissue and maintains its tensile strength for only 7-10 days after implantation. Generally, it is completely absorbed by 70 days; however, loss of strength and absorption vary greatly. Chromic gut is plain gut treated with chromium salts to slow absorption and decrease tissue reactivity by cross-linking the collagen. Its tensile strength is maintained for as long as 10-21 days, and complete absorption does not occur until at least day 90. Plain and chromic gut have decreased use in modern surgery owing to the development of synthetic sutures that are hydrolyzed and therefore less inflammatory. This material is used in the closure of mucosal surfaces or as ligatures for blood vessels, among other uses. Fast-absorbing gut is plain gut treated with heat to facilitate more rapid absorption. It was designed for percutaneous suturing and maintains its tensile strength for only 5-7 days. It is completely absorbed within 2-4 weeks. Fast-absorbing gut is useful for the percutaneous closure of facial wounds under low tension and for securing both split- and full-thickness skin grafts. Polyglycolic acid (Dexon S; Syneture) was introduced in 1970 as the first synthetic absorbable suture. It has high tensile strength, with a retention of 60% at day 7, 35% at day 14, and only 5% at day 28. Polyglycolic acid is completely hydrolyzed by 90-120 days. This braided suture is uncoated and multifilamentous; therefore, it has good handling and knot security properties. However, its high coefficient of friction results in significant tissue drag. To minimize this drag, a polycaprolate-coated form is available (Dexon II; Syneture). This form slides readily through tissue and is easy to tie; however, 4 throws are recommended to ensure secure knots. The tissue reactivity associated with this material is relatively low, but the multifilament nature may potentiate infection. Polyglycolic acid is available as a clear or green suture. A fast-absorbing polyglycolic acid suture (Polysyn FA; Surgical Specialties) is available that maintains tensile strength for 7-10 days and is completely hydrolyzed by 42 days. This suture is useful in wounds requiring short-term dermal support. Introduced in 1974, polyglactin was the second synthetic absorbable suture material available. Like polyglycolic acid, polyglactin is braided and has similar handling and knot security properties. Polyglactin 910 (Vicryl; Ethicon) is coated with Polyglactin 370, which facilitates knot tying and reduces tissue drag; however, this coating also reduces knot security and may require the use of extra throws. The initial tensile strength of polyglactin is slightly greater than that of polyglycolic acid and is absorbed more quickly. Polyglactin retains 60% of its tensile strength at day 14 after implantation and only 8% of its original strength at day 28. It is completely hydrolyzed by 60-90 days. Tissue reactivity with polyglactin is low, less than that of polyglycolic acid. Both of these suture materials may be transepidermally eliminated if buried too superficially in the dermis. Although used primarily as a buried suture, polyglactin has been used for percutaneous closures without adverse outcomes and with resultant cost savings. Polyglactin is available as a clear or violet suture. Two additional Polyglactin 910 sutures have been developed by Ethicon. Vicryl Rapide is Polyglactin 910 that has been ionized with gamma rays to speed its absorption. This product is useful as a buried suture in a wound requiring limited dermal support; it is completely absorbed in 35 days. The newest material is an antibacterial suture (Coated Vicryl Plus Antibacterial; Ethicon). The antibacterial agent used to coat the suture is triclosan. Biocompatibility and implantation studies have shown this to be noncytotoxic and nonirritating. Handling and wound healing characteristics and absorption profile are comparable to the original Polyglactin 910 material. Ford et al  showed that fewer pediatric patients treated with the antibacterial suture had pain on postoperative day 1 when compared with those treated with the original Polyglactin 910 suture (68% vs 89%). Both in vitro and in vivo studies have demonstrated that antibacterial Polyglactin 910 suture inhibits bacterial colonization with both methicillin-sensitive and methicillin-resistant Staphylococcus aureus and Staphylococcus epidermidis. This suture may be useful in wounds at increased risk of infection. A synthetic monofilament absorbable suture, polydioxanone (PDS; Ethicon) was first available in 1982. Although its initial tensile strength is lower than that of the 2 synthetic braided sutures mentioned above, it retains its strength longer. At day 14 after implantation, it has 74% residual initial strength; at day 28, 58%; and at week 6, 41%. Complete hydrolysis occurs by 180-210 days. Polydioxanone is stiff and has poor handling and knot-tying properties. Knot security is likewise low and requires an additional throw. [6, 7] A newer product that has replaced the original product is PDS-II (Ethicon), which has improved handling capabilities. As a monofilament suture, polydioxanone causes minimal tissue reaction. It is useful in contaminated wounds or wounds in locations at greater risk for infection. Polydioxanone is also useful as a buried suture in wounds that require prolonged dermal support. Dermal support of a wound may reduce the spreading of scars. Elliot and Mahaffey  demonstrated that a 16% reduction in the spreading of scars can be accomplished by using dermal support for 3 weeks. They further showed a 38% reduction in spread with the use of dermal support for 6 months. Polydioxanone is available as a clear or violet suture. Polydioxanone is more expensive than polyglycolic acid or polyglactin. Polytrimethylene carbonate or polyglyconate (Maxon; Syneture) was introduced in 1985 as another synthetic monofilament absorbable suture. It has a high initial tensile strength (greater than that of polydioxanone), and it retains 81% of its strength at day 14, 59% at day 28, and 30% at week 6. It is completely hydrolyzed by 180-210 days. Polytrimethylene carbonate is easier to handle and has greater knot security than polydioxanone, polyglactin, or polyglycolic acid. Its tissue reactivity is comparable to that of polydioxanone, its uses are the same, and its cost is lower. Polytrimethylene carbonate is available as a clear or green suture. Poliglecaprone (Monocryl; Ethicon) is a synthetic absorbable material introduced in 1993. Poliglecaprone is very pliable despite its monofilament nature, and, as a result, its handling and knot strength are excellent. Among all absorbable monofilament sutures, poliglecaprone has the highest tensile strength; however, only 20-30% of its strength is retained at day 14 after implantation. Complete hydrolysis occurs by 90-120 days. Poliglecaprone is most useful as a buried suture in wounds in which prolonged dermal support is not essential. Similar to other monofilament sutures, poliglecaprone has minimal tissue drag and reactivity. It is available as a clear material. The cost of poliglecaprone is comparable to that of polydioxanone. An antibacterial form of poliglecaprone is now available (Monocryl Plus Antibacterial; Ethicon). The antibacterial agent is triclosan, which has been shown to inhibit colonization of the suture by methicillin-sensitive and methicillin-resistant S aureus and S epidermidis, Escherichia coli, and Klebsiella pneumoniae, even after direct in vivo challenge with bacteria. The tensile strength and absorption profile are similar to that of untreated poliglecaprone. A monofilament synthetic polyester, Glycomer 631 (Biosyn; Syneture), is another absorbable suture. Rodeheaver et al  compared it to Polyglactin 910 and found it to have greater tensile strength 4 weeks after implantation. The handling characteristics and knot security were also superior. Tissue drag and risk of bacterial infection were lower, likely a result of the monofilament construction. Glycomer 631 retains 75% of its tensile strength at day 14 and 40% at day 21. Absorption is complete between 90 and 110 days. This suture is available undyed or in violet. One of the newest synthetic absorbable sutures is Polyglytone 6211 (Caprosyn; Syneture), which is a rapidly degraded monofilament polyester. Polyglytone 6211 has greater tensile strength, lower tissue reactivity, and improved handling characteristics compared with chromic gut suture. Its greatest advantage, however, is its rapid rate of absorption. It provides secure wound approximation for 10 days, and all tensile strength is lost by day 21. It is completely hydrolyzed in 56 days. Polyglytone 6211 is available undyed or in violet. Nonabsorbable sutures are defined by their resistance to degradation by living tissues. They are most useful in percutaneous closures. Surgical steel, silk, cotton, and linen are natural materials. Synthetic nonabsorbable monofilament sutures are most commonly used in cutaneous procedures and include nylon, polypropylene, and polybutester. Synthetic nonabsorbable braided sutures composed of nylon and polyester are used infrequently in dermatologic surgery. Silk was first widely used as a suture material in the 1890s. It is a braided material formed from the protein fibers produced by silkworm larvae. Although silk is considered a nonabsorbable material, it is gradually degraded in tissue over 2 years. Silk has excellent handling and knot-tying properties and is the standard to which all other suture materials are compared. Its knot security is high, tensile strength low, and tissue reactivity high. Suture removal can be difficult and painful because the braided material becomes infiltrated with cells and encrusted with debris while implanted in the skin. Silk is a soft, pliable suture material that is comfortable for patients and unlikely to tear through even delicate tissues. As a result, it is a good choice for use in mucosal tissues or intertriginous areas. Silk also is useful as a temporary suture to elevate or retract tissues for improved visibility during surgery. It is available in black. Introduced in 1940, nylon was the first synthetic suture available, and it is the most commonly used nonabsorbable material in wound closure. It is available in both monofilamentous and braided forms. Nylon has a high tensile strength, and, although it is classified as nonabsorbable, it loses tensile strength when buried in tissue. Braided forms retain no tensile strength after being in tissue for 6 months, whereas monofilamentous forms retain as much as two thirds of their original strength after 11 years. Monofilament nylon is stiff; therefore, handling and tying are difficult and knot security is low. The suture also may cut easily through thin tissue. Braided forms have better handling properties but greater tissue reactivity and cost. They are used infrequently in wound closure. Monofilament nylon is relatively inexpensive and available as black, green, or clear. Although its greatest use is as a percutaneous suture, because of its low tissue reactivity, nylon (clear) can be used as a buried suture in situations in which prolonged dermal support is necessary. Polyester is a braided synthetic suture with uses similar to those of braided nylon. It has high tensile strength, with good handling, good knot security, and relatively low tissue reactivity. Polyester is available in a coated form that decreases tissue drag. It is a pliable, soft suture similar to silk and can be used in mucosal tissues or intertriginous areas. Additional suture tensile strength can be achieved when polyester is braided or blended with other synthetic fibers such as polyethylene in products like Ethibond (Ethicon) and Mersilene (Ethicon). These sutures, however, are costly and infrequently used for skin closure but instead on deep tissues such as tendon or fascia. Polypropylene (Prolene, Ethicon) is a monofilament synthetic suture that was introduced in 1962. Its tensile strength is lower than that of the other synthetic nonabsorbable sutures. Its handling, tying, and knot security are poor as a result of its stiff nature and high memory. An additional throw is needed for adequate knot security. A method to improve security is the use of thermocautery to fuse the knots or transform the ends into small beads. Tissue reactivity is extremely low for polypropylene, and, unlike nylon, gradual absorption does not occur if it is buried in tissue. As a result, polypropylene is an excellent choice for a buried suture for long-term dermal support. Polypropylene has a low coefficient of friction and easily slides through tissue; this characteristic makes it the suture of choice for a running subcuticular closure. It is a plastic suture that accommodates tissue swelling; therefore, the likelihood of it cutting through the tissue and causing crosshatching is less than that of other materials. However, as swelling of a wound resolves, suture remains loose, and this looseness may affect wound approximation. The plasticity of polypropylene may actually improve knot security in some cases; the knot is tightened as the suture is stretched during wound swelling. Polypropylene is more expensive than nylon and is available as a clear or blue suture. The newest monofilament nonabsorbable synthetic suture is polybutester (Novafil; Syneture). This suture combines many of the desirable characteristics of polypropylene and polyester. Polybutester has a high tensile strength with good handling qualities. Its memory is lower than that of polypropylene, and therefore, its knots are more secure. Polybutester is not a plastic suture, but it has unique elastic properties that allow it to optimally respond to wound edema. Like polypropylene, polybutester has a low coefficient of friction and is an excellent choice for a running subcuticular closure. Polybutester is available as a clear or blue suture. Its cost is comparable to that of polypropylene. Also see the Medscape article Suturing Techniques. Needles are necessary for the placement of suture material in a wound. Needles should be made of high-quality stainless steel, sharp enough to penetrate tissue with minimal trauma, rigid enough to resist bending, and malleable enough to bend before breaking. The sharpness of the needle is determined by the method of sharpening. Hand-honed or electrohoned needles are sharper than those processed by machine grinding. Sharper needles pass more easily through tissue and create less trauma to the wound. They are ideal for fine cosmetic work. The cost of needles is based on the quality of the stainless steel and their sharpness. In choosing a needle for cutaneous surgery, the following should be considered: tissue thickness, tissue type, location, need for cosmesis, suture size, and cost. The structure of a needle includes 3 standard portions: the shank or eye, the body, and the point. The shank is the portion of the needle that is attached to the suture. Swaged needles are preferred in wound closure. They have a hollow shank into which the manufacturer has secured the suture. This portion, the swage, is both the thickest and weakest part of the needle. The body is the portion of the needle between the proximal end of the point and the contour change at the beginning of the swage. In wound closure, the body is usually curved. The curvature is based on a fraction of the arc of a circle; 3/8-circle and 1/2-circle curvatures are most often used. The choice of a particular needle length, width, and curvature depends on the size and depth of the wound and the thickness and type of tissue to be sutured. For example, in deep, narrow, or confined spaces, 1/2-circle needles are easier to handle. The cross-sectional shape of the body can be round, triangular, oval, rectangular, or trapezoidal. The body may be ribbed to improve the holder's grip on the needle. The main functions of the body are to interact with the needle holder and to transmit penetrating force to the point. The needle holder should be placed approximately one-third the distance from the shank to the tip of the point. Holding the needle over the shank may cause it to bend or break. The point is the portion of the needle from the tip to the end of the taper at the maximum diameter of the body. Four types of needle points are available: round, conventional-cutting, reverse-cutting, and spatulated. A round point is tapered and has no cutting edges; it passes through tissue by stretching it. This needle is used for suturing soft, elastic tissues (eg, fascia, muscle) but not skin. Conventional-cutting and reverse-cutting needles are most commonly used in wound closure. They pass through tissue by cutting a path rather than stretching the tissue. Both have triangular shapes and 3 cutting edges. Two of the cutting edges are on opposing sides of the needle. The conventional-cutting needle has its third cutting edge on the inner curvature of the needle and has a tendency to cut through tissue if upward pressure is exerted. The reverse-cutting needle has its third cutting edge on the outer curvature. This needle is less likely to tear through tissue during suturing and is more often used for skin closure. Spatula needle points are flat and 4- to 6-sided with cutting edges facilitating superior control and preventing accidental perforation when suturing delicate tissue. They are most commonly used in ophthalmologic surgery and nail bed repairs. Finally, a new quad-sided needle with diamond geometry (Dermaglide; Look) is available, and it is designed to minimize tissue trauma by retaining its sharpness longer. In addition to the more commonly used curved needles, straight needles are also available. These are typically used in easily accessible tissue where there is adequate space to maneuver the more cumbersome straight design. Keith needles (Medline) are straight needles with a threadable eye, much like traditional fabric sewing needles. The selection of needles is confusing because manufacturers use varying designations for similar needles (see Table 3). Ethicon needles, for example, include FS (for skin), PS (for plastic skin), P (for precision point), and PC (for precision cosmetic) types. Syneture needles include P or PC (plastic/cosmetic), C (cutaneous) and DX (DermaX premium x cutting). Look (Surgical Specialties) makes needles comparable to those made by the above manufacturers. The FS and C types are large, reverse-cutting needles and are the least sharp and expensive. They are useful in the buried and percutaneous closure of wounds on the scalp, trunk, and extremities in which cosmesis is not crucial. The PS needle is similar to the FS needle in size and configuration, but it is sharper and better for cosmetic procedures in areas where the skin is thicker and tougher. The P needles are also reverse cutting, but they are sharper and smaller than the PS needle; therefore, they are an excellent choice for use in thin, delicate tissues when cosmesis is important. The PC needles are conventional-cutting needles, but they have a long, narrow, and very sharp tip that is less likely to tear through tissue. As a result, they cause very little tissue trauma during suturing. PC needles are ideal for fine, detailed work. Staples are formed from high-quality stainless steel and are available in regular and wide sizes. Staples are composed of (1) a cross-member that lays on the surface of the skin perpendicular to the wound, (2) legs that are vertically placed in the skin, and (3) tips that secure the staple parallel to the cross-member. Staples are relatively easy to place and may shorten the closure time by 70-80%. The primary utility of staples is in the closure of wounds under high tension on the trunk, extremities, and scalp. They are also used to secure split-thickness skin grafts. They are not used in delicate tissues or wounds in finely contoured areas, over bony prominences, or in highly mobile areas. Several studies have been conducted to compare the use of staples and nylon sutures on the trunk, head, and neck; these revealed comparable cosmetic results. Advantages of staples include rapid speed of closure, a decreased risk of infection, improved wound eversion, and minimal tissue reactivity. Disadvantages include the need for a second operator to evert and reapproximate skin edges during staple placement, greater risk of crosshatch marking, and less precise wound approximation. The cost is usually more than that of suture material. In skin closure, the staplers used are disposable and loaded with 5-35 staples, depending on the manufacturer. They are lightweight and have handles that are easy to grip and control. The width and height of the staples vary with the manufacturer. Most regular staples are 4-6 mm wide and 3.5-4 mm high. Wide staples for use in thicker skin are 6.5-7.5 mm wide and 4-5 mm high. For staple placement, the stapler is gently held on the surface of the skin, perpendicular to the wound, and the handle is squeezed, plunging the staple into the skin to form an incomplete rectangle. The depth of penetration is based on the pressure exerted on the stapler against the skin. To disengage the staple, the handle is released. If the stapler has an ejector-spring release, it is lifted vertically off the skin. If not, the stapler must be moved anteriorly or posteriorly. 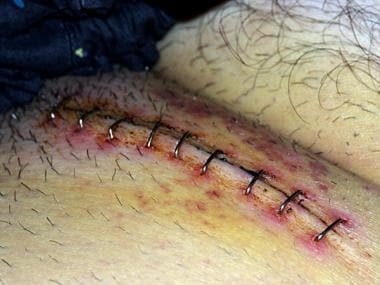 The correct placement of staples is critical to avoid complications such as tissue strangulation and crosshatch marking. Staples should be inserted at 45° or 60° angles. As a wound swells, a staple placed at an acute angle rotates into a vertical position, leaving a space between the cross-member and the skin surface to accommodate swelling. If placed at a 90° angle, the staple cannot move and is likely to strangulate the tissue during swelling. Staplers that are used widely in skin closure include Appose (Autosuture, United States Surgical) and Proximate (Ethicon). A unique stapler is the Multifire Premium stapler (Autosuture), which is disposable but can be reloaded for continued use on the same patient. The Precise Multi Shot “cricket” skin stapler (3M) is a smaller skin stapler designed for more delicate tissue closures or for tacking skin grafts in place. Surgical staples are depicted in the image below. Surgical staples in groin after inguinal hernia operation. Image courtesy of Wikimedia Commons. Staples are removed painlessly by using a specialized set of extractors. Tapes are strips of microporous nonocclusive material (eg, paper, plastic, rayon fabric) backed by a thin film of acrylic polymer adhesive. They are useful as an adjunct to or a substitute for other wound closure materials. Although they are used most often to reinforce a wound after the removal of sutures or staples, they can also be used alone for wounds that are small, nonexudative, and under minimal tension. The advantages of tapes include ease of use, comfort to the patient, and avoidance of tissue strangulation, infection, and crosshatch marks. Follow-up visits for removal are not necessary. Allergic reaction to the adhesive is uncommon. Disadvantages include limited wound eversion, imprecise wound-edge approximation, and inconsistent adhesion. Tapes have little usefulness in hairy or highly mobile areas. Moisture, soap, and wound exudate decrease the duration of tape adhesion. To maximize adhesion, the use of a liquid adhesive is essential. Mastisol (Ferndale Laboratories) and tincture of benzoin are available for this purpose; Mastisol has superior adhesive strength. After the wound is grossly reapproximated, the area should be degreased with alcohol, acetone, or adhesive remover, and the liquid adhesive should be applied over the wound edges and the entire area to which the tapes will be placed. Once the adhesive has dried to a tacky feel, strips of tapes should be placed perpendicularly across the wound without overlapping one another. Additional tapes should not be used parallel to the wound to reinforce the tape edges because this application decreases adherence. Tapes that are kept dry and clean may remain adherent for up to 1-2 weeks. Zempsky et al  compared the cosmetic outcomes of facial lacerations closed with Steri-Strip Skin Closures (3M) or Dermabond tissue adhesive (Ethicon) in 97 patients. At short-term follow-up, more complications were noted in the tissue adhesive group (7) than in the tape group (1). Long-term follow-up revealed no cosmetic difference. Tape closure of simple facial lacerations may be a useful low-cost alternative to tissue adhesives and sutures. Tapes are available in different widths (eg, one-eighth inch, quarter inch, half inch) and colors (eg, white, clear, flesh toned). Commonly available products include Steri-Strip Skin Closures (3M), Cover Strip II (Beiersdorf), and Proxi-Strip Skin Closures (Ethicon). Cyanoacrylates for use in surgery have been available in Canada and Europe for 20 years, but products suitable for use in skin closure in the United States have not become available until recently. Octylcyanoacrylate (Dermabond; Ethicon) and N -butyl-2-cyanoacrylate (Indermil; Syneture) polymerize in an exothermic reaction on contact with fluid to form a 3-dimensional, strong, flexible bond, with uses comparable to those of 5-0 monofilament nylon. Both are available in single-use vials/ampules. Octylcyanoacrylate and N -butyl-2-cyanoacrylate are useful for the closure of simple lacerations in children and uncooperative patients. They are also useful for the closure of incisions under casts or in cases in which follow-up is difficult. They are not for use in areas that are highly mobile or subject to friction (eg, over joints, hands, feet). Both cyanoacrylates are quick and easy to apply, requiring only one-tenth to one-fourth of the time required for suture placement. They may also be used to reinforce incisions closed with suture or staples, as they provide an antimicrobial and waterproof coating, but repeated washing removes the adhesive in a few days. The cosmetic outcome is good, and no postoperative visit is required for removal. Despite the fact that their use on the hands is discouraged, Sinha et al  randomized 50 patients undergoing hand surgery to wound closure with sutures or N -butyl-2-cyanoacrylate. Five wound dehiscences occurred; 3 in the cyanoacrylate group and 2 in the suture group. The study demonstrated that N -butyl-2-cyanoacrylate may be as effective as suturing for cutaneous closure in hand surgery. The cost per unit of cyanoacrylate is higher than that of comparable sutures; however, Osmond et al  performed a cost analysis, comparing the use of sutures to tissue adhesives in an emergency department. They accounted for all equipment, health care worker time, and loss of income for follow-up visits and found that the use of the tissue adhesive was overall cost effective. The use of cyanoacrylates requires that the wound be completely reapproximated before its application. In full-thickness wound closure, a layer of buried sutures is generally required prior to the application of the adhesive. If the adhesive seeps into the wound bed, healing is impaired. Before application, the skin must be defatted with alcohol or acetone. Octylcyanoacrylate is applied in a thin layer over the entire wound and extending 5-10 mm beyond the wound edge. The formation of the bond produces heat that the patient can feel. Once the layer is dried (10-30 seconds), a second layer is applied. Three to 4 layers are necessary. N -butyl-2-cyanoacrylate requires only a single application by droplet that sets in 30 seconds and requires no direct contact with the wound. No additional bandaging is required, and the patient is advised to not perform wound care at home. By 7-14 days, most of the adhesive sloughs with the epidermis, and the remainder may be removed with soap and water or petroleum jelly. A chisel tip applicator is available for the octylcyanoacrylate vial to improve application. An accessory cannula tip can be obtained for use with the N -butyl-2-cyanoacrylate ampule for the same reason. In addition to their indication for use as a surgical adhesive, both cyanoacrylates are approved by the US Food and Drug Administration for use as a barrier against common bacterial microbes, including certain staphylococci, pseudomonads, and E coli. An over-the-counter formulation of octylcyanoacrylate, Liquid Bandage (Johnson & Johnson), was introduced as an occlusive dressing for minor lacerations and abrasions. Martín-García et al  studied this as a dressing over sutured facial excisions and found it to be a convenient and economical alternative to daily dressing changes. Animal studies performed by Simhon et al  and Brosh et al  demonstrated faster reepithelialization, reduced scar width, reduced dermal inflammation, and higher long-term tensile strength in laser-soldered incisions compared with sutured incisions. A clinical study by Kirsch et al  examined laser soldering for hypospadias repair. Operative times and complication rates were reduced compared with standard suturing. Additional studies are necessary to determine the practical use of laser soldering in dermatologic surgery. Rubin JP, Hunstad JP, Polynice A, Gusenoff JA, Schoeller T, Dunn R, et al. A multicenter randomized controlled trial comparing absorbable barbed sutures versus conventional absorbable sutures for dermal closure in open surgical procedures. Aesthet Surg J. 2014 Feb. 34(2):272-83. [Medline]. Smit IB, Witte E, Brand R, Trimbos JB. Tissue reaction to suture materials revisited: is there argument to change our views?. Eur Surg Res. 1991. 23(5-6):347-54. [Medline]. Ford HR, Jones P, Gaines B, Reblock K, Simpkins DL. Intraoperative handling and wound healing: controlled clinical trial comparing coated VICRYL plus antibacterial suture (coated polyglactin 910 suture with triclosan) with coated VICRYL suture (coated polyglactin 910 suture). Surg Infect (Larchmt). 2005. 6(3):313-21. [Medline]. Li Y, Kumar KN, Dabkowski JM, Corrigan M, Scott RW, Nüsslein K, et al. New bactericidal surgical suture coating. Langmuir. 2012. 28:12134-9. Barbolt TA. Chemistry and safety of triclosan, and its use as an antimicrobial coating on Coated VICRYL* Plus Antibacterial Suture (coated polyglactin 910 suture with triclosan). Surg Infect (Larchmt). 2002. 3 Suppl 1:S45-53. [Medline]. Bigdelian H, Sedighi M. Evaluation of sternal closure with absorbable polydioxanone sutures in children. J Cardiovasc Thorac Res. 2014. 6(1):57-9. [Medline]. [Full Text]. Justinger C, Slotta JE, Ningel S, Gräber S, Kollmar O, Schilling MK. Surgical-site infection after abdominal wall closure with triclosan-impregnated polydioxanone sutures: results of a randomized clinical pathway facilitated trial (NCT00998907). Surgery. 2013 Sep. 154(3):589-95. [Medline]. Elliot D, Mahaffey PJ. The stretched scar: the benefit of prolonged dermal support. Br J Plast Surg. 1989 Jan. 42(1):74-8. [Medline]. Rodeheaver GT, Beltran KA, Green CW, Faulkner BC, Stiles BM, Stanimir GW, et al. Biomechanical and clinical performance of a new synthetic monofilament absorbable suture. J Long Term Eff Med Implants. 1996. 6(3-4):181-98. [Medline]. Cross KJ, Teo EH, Wong SL, Lambe JS, Rohde CH, Grant RT, et al. The absorbable dermal staple device: a faster, more cost-effective method for incisional closure. Plast Reconstr Surg. 2009. 124:156-62. Zempsky WT, Parrotti D, Grem C, Nichols J. Randomized controlled comparison of cosmetic outcomes of simple facial lacerations closed with Steri Strip Skin Closures or Dermabond tissue adhesive. Pediatr Emerg Care. 2004 Aug. 20(8):519-24. [Medline]. Sinha S, Naik M, Wright V, Timmons J, Campbell AC. A single blind, prospective, randomized trial comparing n-butyl 2-cyanoacrylate tissue adhesive (Indermil) and sutures for skin closure in hand surgery. J Hand Surg [Br]. 2001 Jun. 26(3):264-5. [Medline]. Shen YM, Sun WB, Chen J, Liu SJ, Wang MG. NBCA medical adhesive (n-butyl-2-cyanoacrylate) versus suture for patch fixation in Lichtenstein inguinal herniorrhaphy: A randomized controlled trial. Surgery. 2012 Apr. 151(4):550-5. [Medline]. Osmond MH, Klassen TP, Quinn JV. Economic comparison of a tissue adhesive and suturing in the repair of pediatric facial lacerations. J Pediatr. 1995 Jun. 126(6):892-5. [Medline]. Martín-García RF, Janer AL, Rullán FV. Octyl-2-cyanoacrylate liquid bandage as a wound dressing in facial excisional surgery: results of an uncontrolled pilot study. Dermatol Surg. 2005 Jun. 31(6):670-3. [Medline]. Gabay I, Barequet I, Varssano D, Rosner M, Katzir A. Bonding surgical incisions using a temperature-controlled laser system based on a single infrared fiber. J Biomed Opt. 2013 Nov. 18(11):111416. [Medline]. Simhon D, Brosh T, Halpern M, Ravid A, Vasilyev T, Kariv N, et al. Closure of skin incisions in rabbits by laser soldering: I: Wound healing pattern. Lasers Surg Med. 2004. 35(1):1-11. [Medline]. Brosh T, Simhon D, Halpern M, Ravid A, Vasilyev T, Kariv N, et al. Closure of skin incisions in rabbits by laser soldering II: Tensile strength. Lasers Surg Med. 2004. 35(1):12-7. [Medline]. Kirsch AJ, Cooper CS, Gatti J, Scherz HC, Canning DA, Zderic SA, et al. Laser tissue soldering for hypospadias repair: results of a controlled prospective clinical trial. J Urol. 2001 Feb. 165(2):574-7. [Medline]. Scherer SS, Pietramaggiori G, Matthews J, et al. Poly-N-acetyl glucosamine nanofibers: a new bioactive material to enhance diabetic wound healing by cell migration and angiogenesis. Ann Surg. 2009 Aug. 250(2):322-30. [Medline]. Nie X, Yang MJ, Deng MJ, Chai JS, Jin Y, Liu LC. Innovative strategies for tissue engineered skin based on multiple growth factors gene transfection. Med Hypotheses. 2009 Oct. 73(4):516-8. [Medline]. Shevchenko RV, James SL, James SE. A review of tissue-engineered skin bioconstructs available for skin reconstruction. J R Soc Interface. 2009 Oct 28. [Medline]. [Full Text].